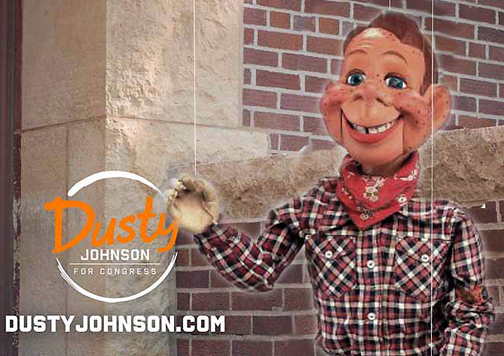 it’s funny to hear dusty complain about welfare, when he’s been collecting a check from the government most of his adult life. All Dusty is, is a commanding voice in a teenage body. He can’t help it, but we could, if we vote smart on November 6th. Oh, and “Howdy Doody” suggests a “Woody,” as in ‘Toy Story’ (not ‘Cheers’) maturity, when I think that “Opie,” or “Richie Cunningham,” is a more appropriate caricature. So it is fair to say, that he is growing up, but slowly, but can we wait for his full maturity, when the issues addressing the mature like Social Security and Medicare seem to be ignored or pushed aside, by an attempt to see who is more Republican, when it comes to issues like abortion or guns…. And “welfare,” really? Where did Opie, I mean Dusty, get that one?…. His grasp of true policy issues seems to be almost as old as the sitcom characters he embodies…. Hey, but then maybe old issues are the only thing truly mature about his candidacy……. Once he’s sacrificed, Darin Smith is next. Then the fat guy that does propaganda interviews. He’s a big target. At some point later there will be good leaders left from the last real men in the infantry squad. He is (unfortunately) likely to win. This will be put to good use over the next two years and will have maximum value in the 2018 bid for re-election.